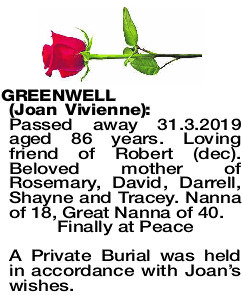 Passed away 31.3.2019 aged 86 years. Loving friend of Robert (dec). 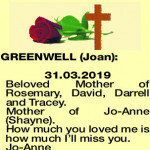 Beloved mother of Rosemary, David, Darrell, Shayne and Tracey. Nanna of 18, Great Nanna of 40. A Private Burial was held in accordance with Joan's wishes. 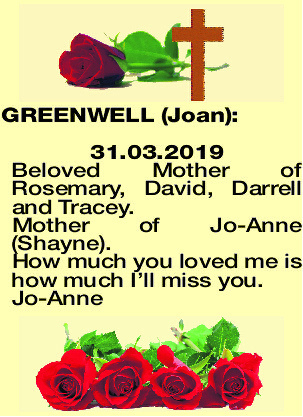 Beloved Mother of Rosemary, David, Darrell and Tracey. How much you loved me is how much I'll miss you.